With each agreement comes different demands from your customers. This article is useful in the case that you need to change a customer to a different Billing Plan. Monthly is the default and most popular basis to bill customers but any variation of weeks, months, years and even daily periods are possible. During the below process you will be assigning a billing plan to an Agreement. Open the agreement you wish to change/assign the Billing Plan for. 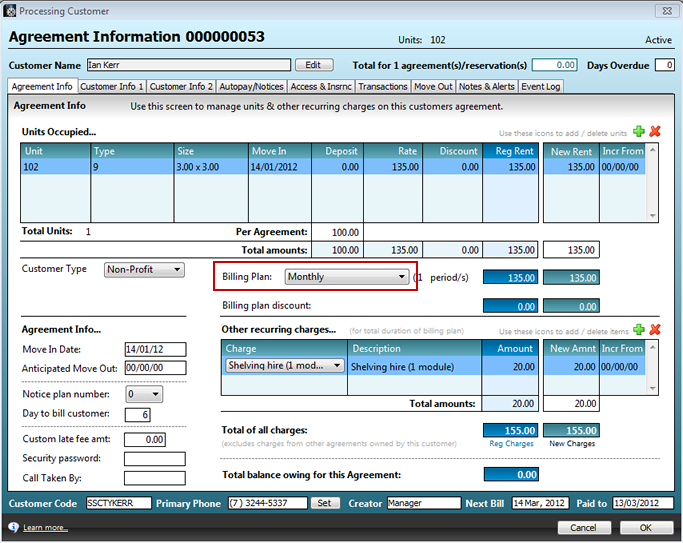 Assign Billing Plan. Select the Billing Plan you want this agreement to be set to. Important: the Reg Rent field will change to reflect the new billing plan and also the periods can be altered to multiply the billing period by the number entered here.